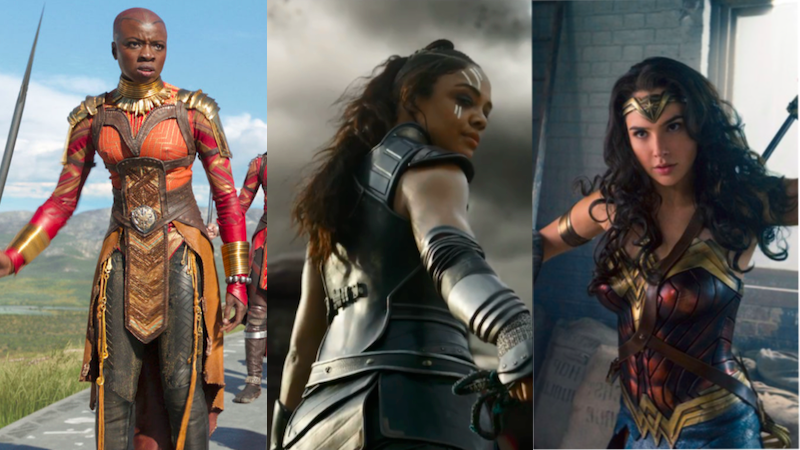 From left to right: Danai Gurira as Okoye in Black Panther, Tessa Thompson as Valkyrie in Thor: Ragnarok, and Gal Gadot as Wonder Woman in Wonder Woman. Every year, GLAAD (the Gay & Lesbian Alliance Against Defamation) publishes an analysis of the current state of LGBTQ representation in Hollywood. This year’s analysis took Marvel and Warner Bros. to task for some of their most recent blockbusters. Despite the fact that Wonder Woman, Black Panther, and Thor: Ragnarok all featured characters that are canonically queer in the comic books, none of the films made mention of the fact. In the latter two films’ case, scenes that explicitly acknowledged that Okoye and Valkyrie are both queer women were considered before ultimately being left on the cutting room floor. “With wildly successful films like Wonder Woman and Black Panther proving that audiences want to see diverse stories that haven’t been told before, there is simply no reason for major studios to have such low scores on the Studio Responsibility Index. GLAAD’s Studio Responsibility Index takes into account a number of factors, like a character’s presence on screen, whether their queerness is explicitly mentioned, and how integral to a movie’s plot LGBTQ characters are. Far too often LGBTQ characters and stories are relegated to subtext, and it is left up to the audience to interpret or read into a character as being LGBTQ. Audiences may not realize they are seeing an LGBTQ character unless they have outside knowledge of a real figure, have consumed source material for an adaptation, or have read external press confirmations. This is not enough. Our stories deserve to be seen on screen just as much as everyone else’s, not hidden away or left to guess work, but boldly and fully shown. GLAAD found that all seven major Hollywood studios ended up doing a generally worse job in 2017 compared to 2016 when it came to getting LGBTQ folks on screen. Out of the 109 movies that the studios put out last year, only 12.8 percent included queer people, with the bulk of those characters being cisgender men and there being no transgender characters at all. So yeah, the current state of queer representation in Hollywood isn’t great. But with films like Deadpool 2, here’s hoping that next year we’ll be able to look back and see that progress, though gradual, is in fact happening.